VPN services offer users the ability to access geo-restricted content across the world and connect to the internet privately to protect their identities from prying eyes. 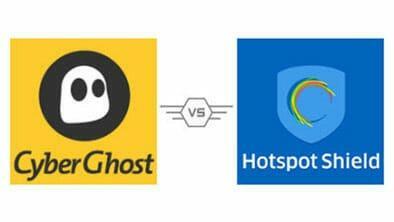 Today, we compare CyberGhost and HotSpot Shield. Read on to see who comes out on top! Security and privacy are major concerns when browsing the web and connecting to public Wi-Fi networks. VPNs offer users a way to connect to the internet via a private connection and avoid prying eyes and hackers. Moreover, they let consumers circumvent geo-restricted content and access any website in the world. There are several options on the market with similar features and finding the right one can be tricky. Our tech experts have decided to compare VPN services to find the best one, and today we’re looking at CyberGhost and HotSpot Shield. Read our VPN comparison to learn more about these two rivals! Our experts test each VPN we compare across a series of key factors that include server availability, speed, pricing, protocols available, and other key features. We also consider user experiences and reports. Discover who takes the top spot in this face-off! We place significant value on a VPN’s accessibility for users. Having more servers and simultaneous connections give users more freedom to access the content they want and avoid restrictive laws. CyberGhost hosts over 1,000 servers, and is compatible with Windows, Android, Mac, iOS, and Linux, with 5 simultaneous connections allowed. HotSpot Shield lags far behind with only 20 servers, though it does provide unlimited bandwidth. They also offer apps for Windows, Mac, iOS, Android, and a browser extension for Chrome. Users can connect 5 devices at one time. Available Streaming Services. The ability to bypass geo-restrictions associated with streaming services is a considerable benefit users seek from their VPN providers. CyberGhost has been effective at unlocking Netflix, as well as Hulu, BBC iPlayer, and HBO Go. HotSpot Shield also offers access to a similar list of streaming services. Mobile Apps. Customers value the ability to protect their browsing on mobile devices as we spend more time on our phones than ever before. CyberGhost and HotSpot Shield each developed apps for iOS and Android devices such as smartphones or tablets, helping keep the most popular platforms covered. Protocols. These encryption algorithms ensure that data is kept safe from the unwanted eyes of pesky marketing companies and governmental bodies. CyberGhost utilizes popular IKEv2 and OpenVPN protocols. HotSpot Shield, on the other hand, utilizes the IPv6 protocol, as well as its proprietary Catapult Hydra encryption, which is based on AES-128-bit standards. However, because HotSpot doesn’t offer specifics, it’s hard to confirm how well it works to protect your privacy. Money Back Guarantee. Most providers grant eligible subscribers customers a 30-day money-back guarantee if they decide they do not want the service. CyberGhost maintains the market’s standard 30-day policy, but HotSpot Shield outshines its rival with a friendly 45-day refund period. Kill Switch. If your encrypted connection suddenly begins acting out, this function is every client’s best friend for disconnecting from an unsecured connection. Both CyberGhost and HotSpot Shield provide this helpful tool to keep users’ web activities secured. Zero Logs Policy. Whatever your reason for using a VPN service, privacy is an important consideration, and companies that keep track of user activity may be a red flag for some. CyberGhost and HotSpot Shield vow to never log client activities or store their data for any purpose. However, it was reported that Cyberghost already cooperated with authorities to divulge users’ logging data. Speed. The need for safety should not come at the expense of connection speeds. Both companies scored high marks for connections, though HotSpot Shield stands out with speeds that show barely any drop-off relative to a comparable unsecured connection. Anonymity and safety are the foundations, as well as the goals, of any VPN. When our experts conduct a VPN comparison, one of the first things they look at is how well a company protects its users online. CyberGhost utilizes IKEv2 and OpenVPN protocols to ensure personal details remain encrypted and provides a kill switch function if there happens to be a momentary issue with the connection. This brand states that it will not copy or keep records of users’ transactions or other activities at any time. HotSpot Shield, however, works with IPv6 and uses a proprietary protocol, which makes it hard to determine its veracity. However, for security-conscious users, the company also has a no-logging policy in place. A VPN service must have a staff capable and ready to resolve any issues a client may encounter during his or her subscription. CyberGhost’s representatives can be reached via a live chat feature, though the company’s support is not available around-the-clock. By comparison, HotSpot Shield’s staff is available by inquiry form online, though they don’t have a live chat option. Both companies’ representatives respond quickly and are readily able to answer most queries effectively. Finally, we conduct VPN price comparison between our two contenders. CyberGhost offers 3 subscription plans, all with a 30-day money-back guarantee. HotSpot Shield has three plans for the paid service, with a generous 45-day refund policy. They also offer a free VPN. Despite our experts’ best efforts, we were unable to find a clear winner, as each provider came to the table with its own distinct advantages. Security-oriented users may prefer to go with CyberGhost’s tried-and-true protocols, as well as its vast number of servers which can mask user activity. HotSpot Shield shines for its blazing speeds and features such as ad blocking and split tunneling. In either case, both deliver top-notch service that makes each applicable for prospective VPN subscribers depending on their needs. If you would like to pick which brands we feature next, write the names in the comments below.